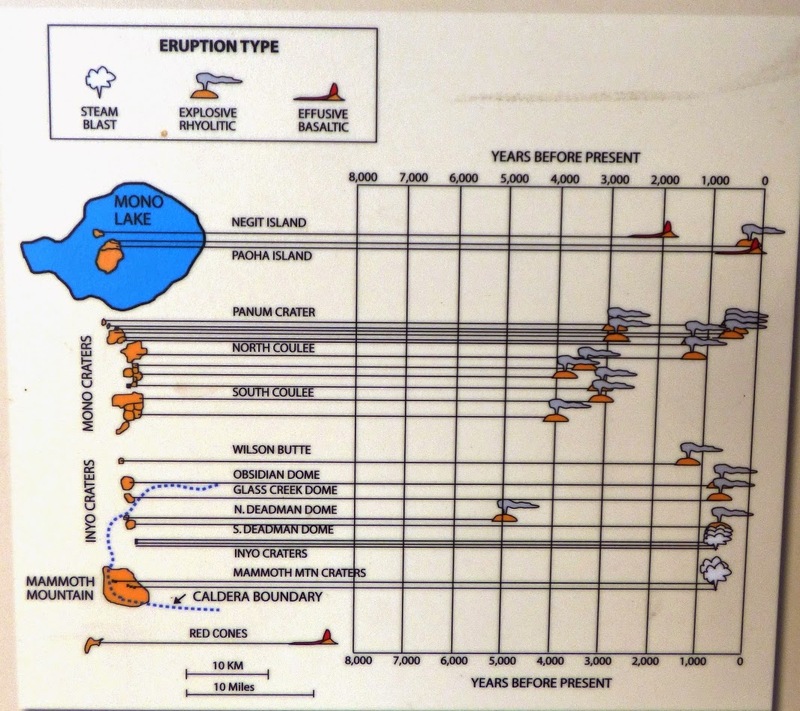 In the 1980s and unfortunate series of events led to conflict in Mammoth Lakes between geologists concerned about a possible volcanic eruption, and civic leaders and business people worried about their economy and profits. The conflict was exacerbated by irresponsible reporting in the national media. The problems would have been trivial had the volcano actually erupted, but in the end the magma cooled to solid rock at a depth of 7,000 feet or so. The possibility of volcanic activity in the Mammoth Lakes/Inyo Craters/Mono Lake area is very real. Studies show a dozen or more volcanic events in the last thousand years, and the region is constantly shaken by earthquakes, and riddled with hot springs and steam vents. Things have been mostly calm in recent years, and the warning stage is currently green. The Long Valley Caldera is currently at rest, but hot magma still exists at a depth of three or four miles. As noted in some of my previous posts, the Long Valley Caldera exploded in apocalyptic fury about 760,000 years ago, releasing some 150 cubic miles of ash into the atmosphere. As the eruption evolved, the Earth's crust collapsed into a massive hole 20 miles long, 10 miles wide, and as much as three miles deep. Probably the last thing anyone would want to find out is that a second caldera exists in the region. But it's not anything to worry about. It went extinct around 100 million years ago in the middle Cretaceous period. 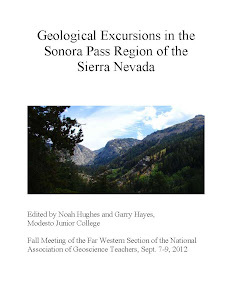 Try to imagine what it is like at a depth of two miles or so in the present day Long Valley Caldera. When the crust collapsed during the climactic eruption a hundred million years ago, huge chunks of rock hundreds, even thousands of feet across fell into the mix of magma and ash. And a great many dinosaurs perished (now that's a thought, but this was a much more local event, not the K/T extinction). A great deal of time passed. Plutons of molten rock intruded the old caldera, cooling slowly to form a granite-like rock, and metamorphosing the older volcanic rocks into slate, schist and greenstone. 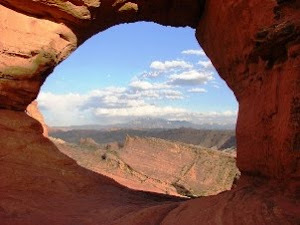 Even more time passed, and tectonic activity caused the crust to rise many thousands of feet. Erosion stripped away the overlying rock, and the depths of the ancient caldera were exposed to the air, water, and eventually, glacial ice. What had once been the deep interior of a gigantic caldera now stood as high castle-like cliffs. 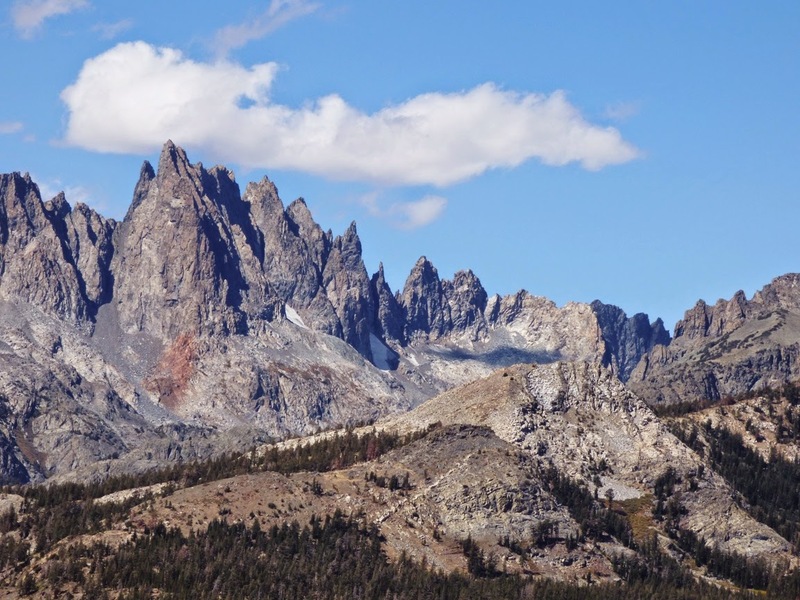 That is the story of the Minarets, seen in spectacular fashion from Minaret Summit just a few miles up the hill from the Mammoth Lakes ski resort. The rugged ridge of the Minarets and the high peaks of Mt. Banner and Mt. Ritter are not actually on the eastern crest of the Sierra Nevada. They lie a bit to the west of Mammoth Mountain and the headwaters of the west-flowing San Joaquin River lie between the two ridges. 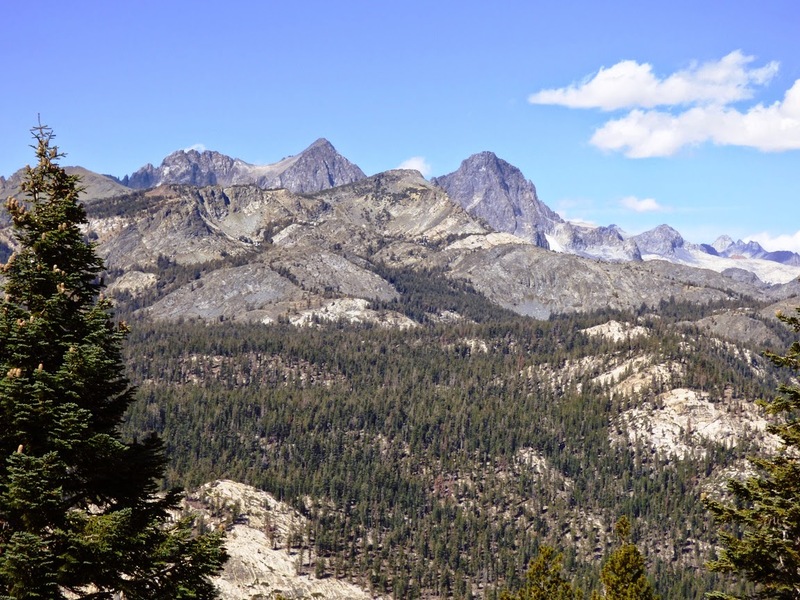 The dark peaks of metamorphic rock have always contrasted strongly with the "usual" granite of the Sierra high country. I once had a marvelous adventure in the Minarets. 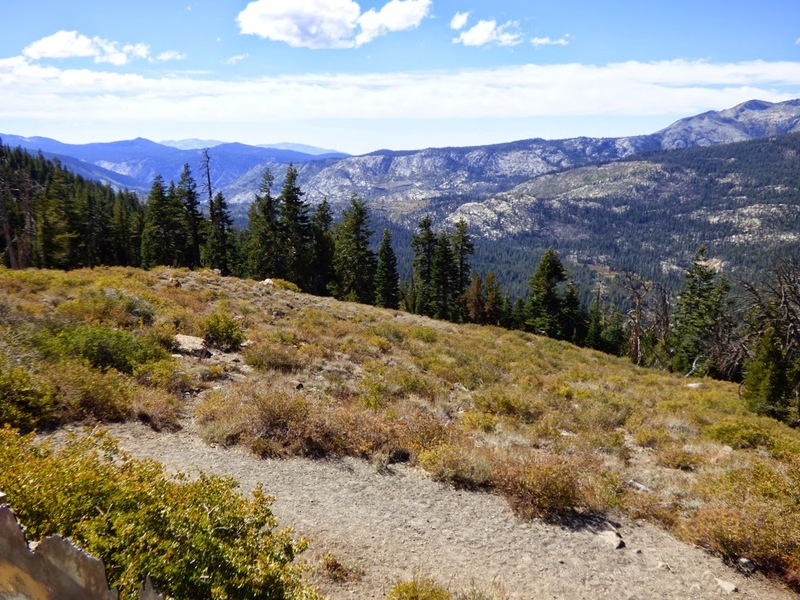 Decades ago, I was looking for a post-high school adventure, and ended up walking most of the John Muir trail. We tried to follow a few alternate routes in some places, including an attempt to make a cross-country climb over the pass above Iceberg Lake at the base of the Minarets. Unfortunately the lake was living up to its name, and was still frozen over. The pass above was covered in snow, and we had no equipment to surmount the obstacle. We had to backtrack quite a few miles to catch an alternate route. Just about then, our mosquito repellent ran out, so we more or less ran, arms waving at the swarming insects, ten miles or so to Reds Meadow and Devils Postpile. The Minarets had totally rebuffed our efforts to pass through. We took an alternate route that involved hitchhiking to Mammoth Lakes, consuming hamburgers, and following a much easier trail past Duck and Purple Lakes. I've wondered why the Minarets were never incorporated into nearby Yosemite National Park. I strongly suspect that the metamorphic rocks had mineral plays and potential mining claims. I've heard (but can't confirm) that a large body of magnetite somewhere in the Minarets screws up attempts at orienteering with compasses. 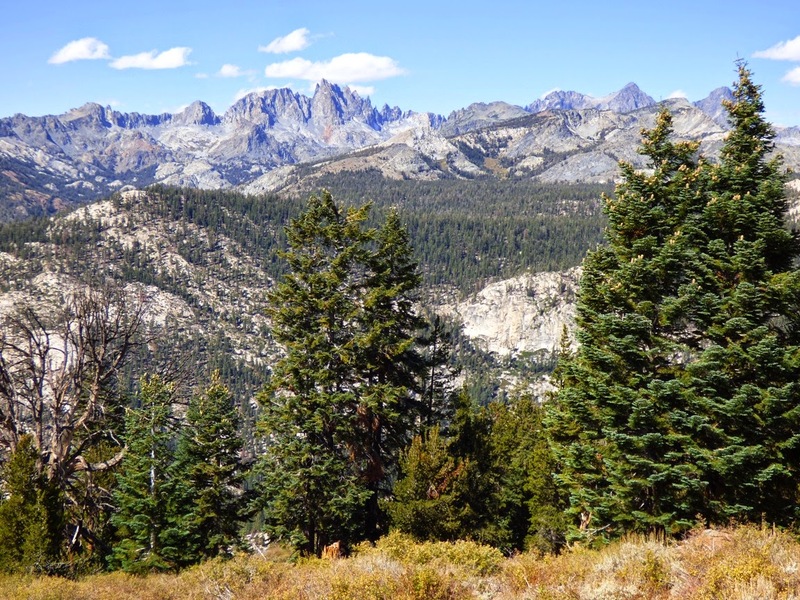 In any case it's a protected wilderness today, and a spectacular place to view some of the more unusual rocks to be seen in the high country of the Sierra Nevada. And there aren't any active magma chambers underneath.